As educators, one of our key roles is to engage parents in their child’s education. In addition to conventional parents’ evenings, reports and newsletters why not draw on what we do best – teaching – and get parents back into the classroom as students? A recent workshop at a small rural first school in Staffordshire is a prime example of how powerful this method of engagement can be. St Leonard’s First School headteacher Julie Lane was keen to promote the use of smart technology to enhance learning, and approached us with the idea of hosting a workshop to help parents to ensure their children make the most of their iPads and tablets at home while staying safe online. The result was an evening course that covered how to manage tablets and set up different restrictions to make them more secure for children to use, as well as exploring various free apps to encourage youngsters in educational use of their tablets and iPads. In addition to providing parents with peace of mind that they can ensure their children stay safe online we wanted to make the session fun and interactive. We explored how to make puppet shows on the iPads and each group of parents produced their own little show about a Princess called Prudence and her handsome knight, Kevin! I wanted to show parents how easily their children can create exciting multimedia projects and use the iPad for learning as well as for games. We also explored augmented reality using children's own drawings and brought their artwork alive with video explanations from the children themselves. 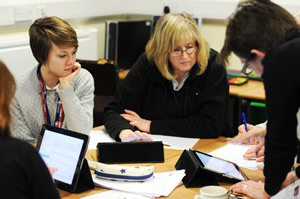 The feedback from the session has been great – the school reports parents commenting on how useful they found the experience, and has gone on to set up a regular ICT evening club that is attended not only by parents but members of the wider community, as well as including ICT tips and app reviews in its newsletter. Why seek to constantly reinvent the wheel when often a back to basics approach, focusing on the skills we have as teachers, can have the biggest impact? For more ideas on how to engage parents in e-safety matters, take a look at the E-safety Support Parent Pack or if you are interested in running a parents’ workshop on e-safety, iPad skills or a host of other topics at your school? Contact Fantastict on 0800 030 5241. Don't forget, all E-safety Support Members qualify for a free needs analysis and Premium and Premium Plus members can also claim discount of Fantastict courses.